Unlike other legal programs – which deal with legal problems after they happen, Business Secure™ is designed not only to deal with legal issues as they arise; it is designed to prevent legal problems before they happen. As businesses grow, legal issues grow. Business Secure™ was specifically created to alleviate the small business owner’s anxieties when legal issues pop-up. Remember, “time,” is the small business person’s biggest asset and expense. To not have your legal questions answered in a timely manner can mean life or death to any business. Understanding the needs of the business — your business — is fundamental to making the law work for you. Business Secure™ guides the client with both in mind, allowing them to have the confidence to make sound business decisions. The strategies and benefits of Business Secure™ provide to the small business owner that the decisions made are to the benefit of the client, placing the client in the driver’s seat to expand and prosper. 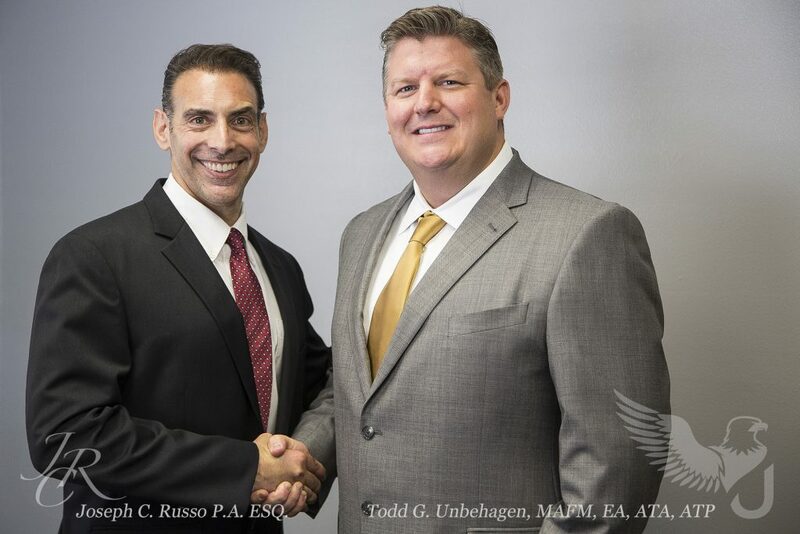 JOSEPH C. RUSSO, has been practicing law in the Tampa Bay area for over nineteen years. His practice focuses on business contracts and transactions, including asset sales and commercial real estate transactions as well as business entities, start-ups, and small business practice. I always tell people what I really do is manage “emotion.” It is our job to listen thru the emotion and guide the client to the logical reality and at the same time, understand their sensitivity to the issue. Without having the access to an attorney and a network of other trusted advisors to lean on, a business owner is really putting themselves at a disadvantage. Business is competitive, it changes all the time, and a small business owner needs access to business professionals on a consistent basis in order to be successful. Located in Tarpon Springs (main office) and Tampa we are a tax, accounting, investment and insurance services firm. We have dedicated, professional, expert advisors in each of our four separate divisions working together as one team. We’ve been serving the Tampa community for over 20 years. To set up free consultation with one of our expert advisors, please call us at (727) 934-7759. There’s no better day than today to get your financial affairs in order! So call us to schedule a free consultation with one of our expert advisors. We’d love to get started working for you right away. If you want help with your small business, need a financial plan, want to review your insurance policies or simply want to pay the lowest amount of tax legally possible, call our office and schedule an appointment today. Web Design & SEO by Archi FX Inc. This website was proudly built with by Archi FX LLC. All images are property of Archi FX LLC. and Unbehagen Advisors. All rights reserved.